The first time anyone talked about adaptive refresh rates for monitors – specifically applying the technique to gaming – was when NVIDIA demoed G-SYNC back in October 2013. The idea seemed so logical that I had to wonder why no one had tried to do it before. Certainly there are hurdles to overcome, e.g. what to do when the frame rate is too low, or too high; getting a panel that can handle adaptive refresh rates; supporting the feature in the graphics drivers. Still, it was an idea that made a lot of sense. The impetus behind adaptive refresh is to overcome visual artifacts and stutter cause by the normal way of updating the screen. Briefly, the display is updated with new content from the graphics card at set intervals, typically 60 times per second. 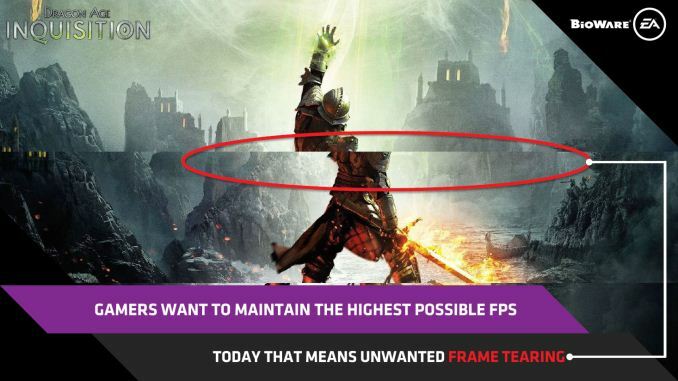 While that’s fine for normal applications, when it comes to games there are often cases where a new frame isn’t ready in time, causing a stall or stutter in rendering. Alternatively, the screen can be updated as soon as a new frame is ready, but that often results in tearing – where one part of the screen has the previous frame on top and the bottom part has the next frame (or frames in some cases). Neither input lag/stutter nor image tearing are desirable, so NVIDIA set about creating a solution: G-SYNC. Perhaps the most difficult aspect for NVIDIA wasn’t creating the core technology but rather getting display partners to create and sell what would ultimately be a niche product – G-SYNC requires an NVIDIA GPU, so that rules out a large chunk of the market. 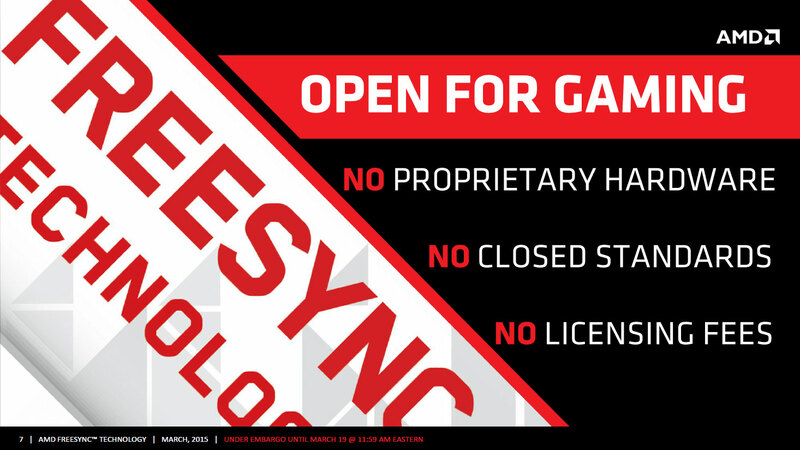 Not surprisingly, the result was that G-SYNC took a bit of time to reach the market as a mature solution, with the first displays that supported the feature requiring modification by the end user. Over the past year we’ve seen more G-SYNC displays ship that no longer require user modification, which is great, but pricing of the displays so far has been quite high. At present the least expensive G-SYNC displays are 1080p144 models that start at $450; similar displays without G-SYNC cost about $200 less. Higher spec displays like the 1440p144 ASUS ROG Swift cost $759 compared to other WQHD displays (albeit not 120/144Hz capable) that start at less than $400. And finally, 4Kp60 displays without G-SYNC cost $400-$500 whereas the 4Kp60 Acer XB280HK will set you back $750. 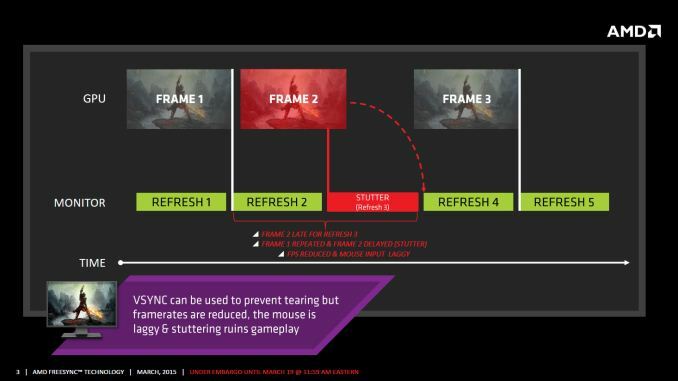 When AMD demonstrated their alternative adaptive refresh rate technology and cleverly called it FreeSync, it was a clear jab at the added cost of G-SYNC displays. 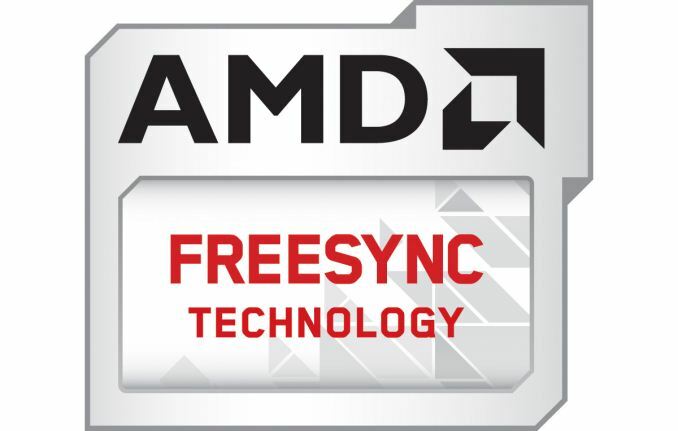 As with G-SYNC, it has taken some time from the initial announcement to actual shipping hardware, but AMD has worked with the VESA group to implement FreeSync as an open standard that’s now part of DisplayPort 1.2a, and they aren’t getting any royalties from the technology. That’s the “Free” part of FreeSync, and while it doesn’t necessarily guarantee that FreeSync enabled displays will cost the same as non-FreeSync displays, the initial pricing looks quite promising. There may be some additional costs associated with making a FreeSync display, though mostly these costs come in the way of using higher quality components. The major scaler companies – Realtek, Novatek, and MStar – have all built FreeSync (DisplayPort Adaptive Sync) into their latest products, and since most displays require a scaler anyway there’s no significant price increase. But if you compare a FreeSync 1440p144 display to a “normal” 1440p60 display of similar quality, the support for higher refresh rates inherently increases the price. So let’s look at what’s officially announced right now before we continue. The 'gsync module's was all smoke and mirrors and worthless. Not sure why people are bashing Gsync, it still is fantastic. So it puts a little more on price on hardware..you are still forgetting the main drive why gsync is better. It still works on nvidia hardware and freesync STILL requires a driver on nvidia hardware which they have already stated won't happen. Do you mean to say that it's available for 1.3 but optional, or that 1.3 doesn't support adaptivesync at all? It does support it in 1.3, according to their FAQ, but doesn't say it's mandatory or not. That is definitely not true. Tearing happens between the graphics card and the display, it doesn't matter what the source is. If you watch a movie at 24fps on a screen that is running at 60Hz connected to a PC, there is a chance for tearing.